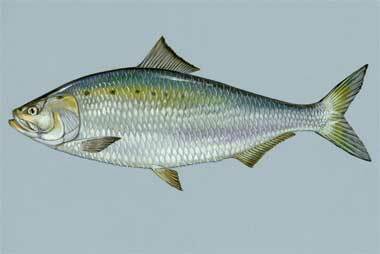 American shad illustration by Duane Raver / USFWS (public domain). Connecticut designated the American shad as official state fish in 2003. Representative Faith McMahon proposed House Bill 5442 to designate the American Shad as the State Fish of Connecticut. In her testimony, she stated, "It is important to recognize the importance of the shad both in Connecticut's history and its economy. The shad is as much a part of the history and traditions of Connecticut as the Connecticut River. . . .as a source of food and commerce for our state. As our state has changed from the time of the Native Americans and the early settlers to the colonial era, to Civil War era and the 20th Century, the shad has run in our rivers and through the Long Island Sound every spring, heralding the end of winter and the renewal and replenishing of the earth."